A bevy of bloom-big events are bursting at the Russian River Rose Company. April and May weekends'll be positively glorious, and lush with outdoorsy events, at the Russian River Rose Company. RUSSIAN RIVER ROSE COMPANY, a repository for all things rosy, and for other petal-rocking favorites, too, like irises. And the destination will again burst with activities and theme happenings over every weekend of April and May 2019. Weekend #1, on April 6 and 7, is "A Happy Rose Garden 'How To'," while the final weekend in May, Memorial Day Weekend, is devoted to "Tea and Memories." 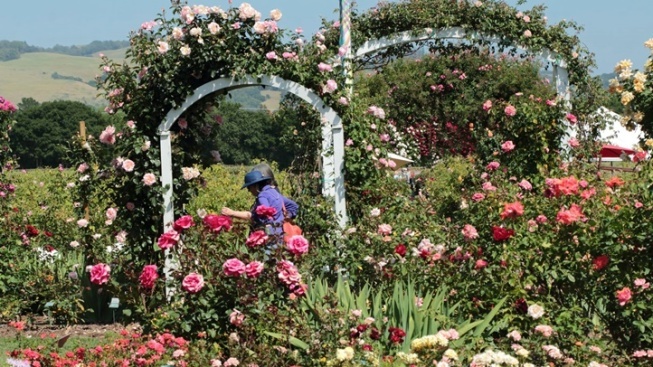 Other weekends will cover climbing roses, Sights and Scents in an Enchanted Rose Garden, and the very popular Mother's Day Weekend happening. Demonstrations are also common during this time, if you not only want to admire the colorful scene but also take some knowledge home. Need more? Turn your nose to the breeze and pick up the scent, and the dates/times/info, now.